Each of these books has been very helpful to me in my own research (dozens more have not been, and are not shown here) and deliver great information. However, they don't replace a doctor's advice and their recommendations may not be right for everyone. Always check with your doctor first before following any of the recommendations in these books. This is without a doubt, the best book I have ever read on fighting cancer with natural medicine. Anyone who has cancer or wants to help someone with cancer should read this bookâ€"as should all doctors who treat cancer patients. Written by a PhD naturopathic doctor and edited by a team including board-certified oncologists and other experts in their fields (most have medical degrees or PhDs), you just can't find better information on using natural medicines for cancer. Twenty-two specific types of cancers are addressed, with easy-to-read information and recommendations on which natural medicines and supplements to use for each cancer, including guidance on dosages and a summary of results from clinical trials showing just how cancer patients benefitted from them. The only weak points of this book are that it lacks in-depth recommendations on diet and also overlooks some important treatments like IV vitamin C. Nonetheless, a must-have for all those wanting the latest information on this topic. This is a companion book to the one above, also by the same two main authors. It has great advice for cancer patients who want to accelerate the healing process, improve quality of life and reduce the risk of their cancer coming back. With chapters on the mind-body connection, diet, exercise, nutritional supplements and "five pathways" to rejuvenation, it covers a lot of ground in less than 200 pages. Again, diet recommendations are a bit general but very much in the right direction. This book brings together many years of the research and practical findings of the author Dr. Keith Block, who is the director of the Block Center for Integrative Cancer Treatment in Illinois, USA. It's hard to find someone more qualified to write a book on combining alternative medicine with standard practice! The information is every bit as detailed as The Definitive Guide to Cancer. However, Dr. Block does not organize his chapters into specific cancers but rather general principles to be followed by all cancer patients, such as how to deal with thickening blood, boost immunity, control your blood sugar levels (so as not to "feed" the cancer cells) and deal with emotional stress. There's also practical information on preparing for and reducing the side effects of standard therapies (surgery, chemo, radiation) as well as the detailed chapters on diet, exercise, mind-body, and spiritual aspects of health. This all makes it an invaluable addition to the library of anyone interested in using natural medicine for cancer. Dr. Servan-Schreiber has excellent credentials for writing a book about preventing and/or treating cancer. He has himself fought a personal battle with brain cancer for 20 years, at first treating it with conventional methods only to watch it come right back again. That's when this clinical professor of psychiatry decided to use integrative medicine to fight his disease, and successfully held back his cancer many years longer than anyone thought possible. Sadly Dr. Servan-Schreiber died from his cancer in July 2011, but his book continues to help cancer patients world-wide (and continues to be a best-seller). Chapters cover the basic concepts of cancer and its weaknesses, an overview of anticancer foods and how to use them in your diet on a daily basis, and some unique chapters covering attitude, personality and learning to change. Finally, this book starts to get into the details of diet and cancer that the above books missed, and these chapters are packed with golden nuggets of information. However, these nuggets are somewhat randomly scattered and very hard to find again once you have read past them. My advice: take your highlighter and some page markers as you read this book to keep track of those important points (my copy is full of them). You will definitely want to go back and review them later. Of all the books I've read on this topic, Foods to Fight Cancer delivers by far the most detailed information on specific anticancer foods. It's also surprisingly easy to read: packed with colourful pictures and helpful charts, every chapter gives a fascinating look at the food's history as well as specific anticancer properties. The only shortcoming is that it focuses on relatively few food groups (eight, plus chapters on chocolate, green tea and curcumin) and therefore misses a lot of important foods. However, the authors do dig deep on the foods they cover. For example, the chapter on green tea is so detailed that it has a chart comparing the EGCG levels of 17 different types of green tea (I've found this nowhere else) and offers tips on brewing your green tea to maximize EGCG content. Vitamin D is without a doubt the single most important nutrient in the fight against cancer, yet most people don't have adequate levels. Dr. Michael Holick, probably the world's leading expert on the topic, explains in simple terms how much we need, how best to get it, and what it does for your health. He also gives practical information on optimal levels of sun exposure for each skin type, time of year, and location of where you live. There is one important discovery that was made after Dr. Holick wrote this book: your body requires magnesium to properly make, transport, store and utilize vitamin D (all such enzymes contain magnesium). And as much as 80% of North Americans are magnesium deficient. Latest studies suggest that boosting your daily magnesium intake by at least 100 mg either through supplements or by eating magnesium rich foods (nuts, legumes, whole grains) can boost the anti-cancer power of vitamin D as much 500%. Michael Murray is one of the world's leading experts on natural medicine. Here, he offers an excellent overview of Natural Medicine against cancer, backing up his information with published research studies and trials that were available at the time. Although somewhat dated, this book is so exceptionally well researched and clearly written, it is an excellent platform to kick-start your understanding of this topic and enable you to do your own research. This is currently the #1 best-selling cancer cookbook. Its recipes are packed with anticancer superfoods and are designed not only to be delicious and nourishing, but also to address specific concerns of cancer patients such as fatigue, altered sense of taste and decreased appetite. It's easy to find out which foods you should eat to fight cancer, but getting those foods into your daily diet is much harder. This book will help you make that transition and keep you eating the foods you need. These books are highly technical and likely to be more of interest to the researcher or health care professional looking to deepen their knowledge with a large collection of focused research brought together in a convenient, single volume. This list will be regularly updated. 1. Cancer and the Search for Selective Biochemical Inhibitors, Second Edition. Hoffman covers this topic from A-Z by starting with a chapter on the origins of cancer and then one on biochemical insights into cancer. He then presents a thorough treatment of anticancer plants and herbs and an in-depth analysis of the underlying biochemical principles for alternative cancer therapies. A whole chapter is devoted to Enzymatic Biochemical Treatment Protocols. The author then examines anticancer plant substances such as garlic, and other alternatives such as Vitamin C, essiac tea, shark cartilage, and cat’s claw. A survey of anticancer plants from around the world is also presented with special emphasis on South Africa, China, Russia, Mexico, Australia, Egypt and Israel, United States and Great Britain. This is another excellent review of using natural products against cancer, however the focus here is on chemoprevention (stopping cancer before it starts) rather than killing cancer cells once they have presented. The opening chapter covers the epidemiology of cancer, followed by 16 chapters on the pathophysiology of cancer. The bulk of the book (almost 400 pages) is then dedicated to a detailed treatment of 20 individual supplements or botanicals and their role in cancer prevention, including: tea, curcumin, resveratrol, palm tocotrienols, pycnogenol, maitake mushroom, lycopene, astaxanthin, coenzyme Q10, probiotics, berries, polyphenols, flavonoids, and vitamins C and E.
With 19 currently active clinical trials against cancer registered with the NIH, and over 1358 research articles cited on PubMed, curcumin is second only to green tea as the most researched botanical in the fight against cancer. This is the first ever comprehensive monographic volume on turmeric (curcumin). Going far beyond just medicinal uses, it covers turmeric comprehensively, including the botany, genetic resources, crop improvement, processing, and its use as a spice and flavoring. Of greatest interest to cancer researchers will be the 40 page chapter on the Bioactivity of Turmeric, and the 90 page chapter on Curcumin—Biological and Medicinal Properties. Each chapter is heavily referenced with an exhaustive bibliography. Representing a thorough treatment of all available research at the time of its publication, this book is a must-read for any serious researcher in this field. This is the only textbook on pomegranates I know of, and it is recent enough to have most of the ground breaking research on the health benefits of the red fruit. The coverage in this text is comprehensive: there are chapters covering the commercialization, botany and post-harvest biology and technology of pomegranates (sections 3 and 4). 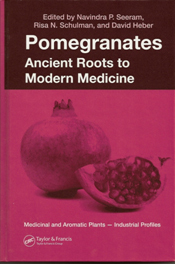 However the bulk of the text is devoted to health effects of pomegranates and the biochemical basis thereof. Section 1 covers the biochemistry in great detail over 60 pages: phytochemical profiles, antioxidant properties and bioavailability of the polyphenols. Section two breaks up health effects into 4 sections: cardiovascular, anti-cancer, estrogen effects and anti-microbial action. The cardiovascular section specifically covers heart disease and stroke prevention. 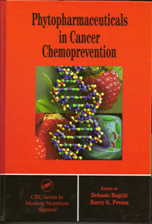 For cancer effects, a general chapter on the anti-cancer potential is followed by a chapter on molecular mechanisms of chemoprevention, and then one focusing on prostate cancer chemoprevention. Green tea is currently the most researched botanical in the fight against cancer: there are currently 27 active clinical trials with the NIH using green tea or its extracts against cancer, and over 2689 citations on PubMed for research articles involving tea and cancer. This book is somewhat dated, but quite intriguingly the author worked for Tokyo Food Techno Co, Ltd, a subsidiary of the Mitsui Norin Co., Ltd—the developer of Polyphenon E. Of the 27 active clinical trials on green tea against cancer, at least 17 are using Polyphenon E, which is a caffeine-free, defined catechin content extract of green tea using a special spray drying process. This process is described in the book. 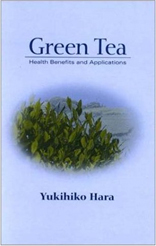 In addition, there are well documented chapters on green tea’s antibacterial action, antiviral action, anticariogenic action, anti cancer properties, lipid lowering effects, hypoglycemic and blood pressure lowering effects, pharmacokinetics, and toxicology. Also covered are the history and production methods of green tea. This is an exhaustive review of plant genera and species with documented anticancer properties which goes far beyond the handful of species being currently tested in clinical trials. Over 150 terrestrial plant genera and species are presented including their distribution, botany, culture, and active ingredients. For any researcher looking for the next generation of anti-cancer botanical, this is an invaluable aid which also covers chemistry, biosynthesis, and mode of action. Current cancer screening methods are discussed as are the significance of primary and secondary metabolites. There is also a quite comprehensive 45 page chapter covering cytotoxic metabolites from various marine algae. By: Bruce W. Halstead, M.D. No discussion of using natural medicine against cancer is complete without including traditional Chinese medicine. Despite the many known clinical trials ongoing in North America and Europe, thousands of years worth of wisdom and practice in Chinese herbal medicine remain largely untapped by Western medicine. This volume is a summary of a fact-finding trip to countries using Chinese herbs against cancer (Japan, China and Taiwan) in normal clinical practice. There are also chapters with easy-to-understand introductions to cancer, its origins, and the importance of immunology. The history of Chinese medicine is also presented as well as the philosophy behind Chinese herbal formulations. Methods of preparing plant extracts are also given. 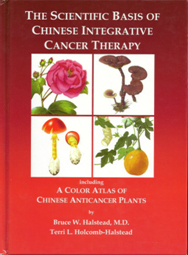 Most important, however, is 103 page color atlas of the main anti-cancer plants used in Chinese medicine. Each herb is pictured in color and details are provided on the plant’s anti-cancer properties and specific pharmacology. Bruce Walter Halstead, MD, was a pioneer of integrative medicine. He died in 2002 after authoring over 50 books. He also founded and directed The World Life Research Institute. Terri Lee Holcomb-Halstead specialized in ethno-botany and integrative medicine and continues Bruce’s work. This book is an excellent primer on Chinese medicine for cancer and is not as technical as the other texts in this section—most people would be able to follow it. The only drawback of this book is that the products of one particular herbal company are pushed a bit hard. DISCLAIMER: Ethan Evers recommends books, periodicals, websites and other media for information purposes only, and has no responsibility for their content. Regardless of the content of recommended materials, Ethan Evers does not provide medical advice directly or through recommended materials. All matters regarding your health require medical supervision and advice from an appropriately licensed medical practitioner. Ethan Evers is a participant in the Amazon Services LLC Associates Program, an affiliate advertising program designed to provide a means for sites to earn advertising fees by advertising and linking to amazon.com.